Tsepinite-Ca: Mineral information, data and localities. Named after Anatoliy Ivanovich Tsepin (b. 1946), physicist of the Institute of Geology of Ore Deposits, Petrography, Mineralogy and Geochemistry of the Russian Academy of Sciences (IGEM), specialist in X-ray spectroscopy and the electron-microprobe analysis of minerals, who initiated in the 1970s an electron-microprobe investigation of Labuntsovite Group minerals. This page provides mineralogical data about Tsepinite-Ca. very weak: r < n.
Combine both in sheaf-like clusters up to 2 x 6mm large and chaotic open-worked aggregates up to 1cm as maximum dimension. 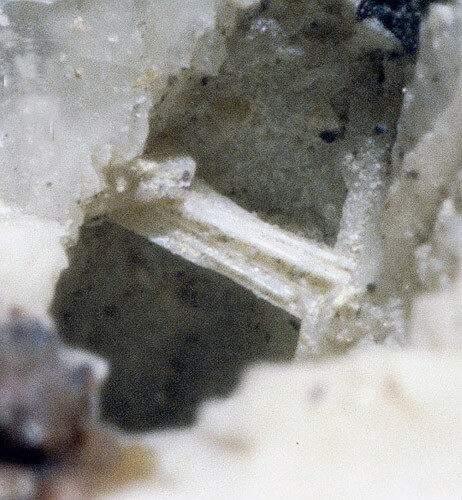 Coarse long-prismatic to needle-shaped crystals up to 0.2 x 0.6 x 5mm in size. Tsepinite-Na Na2(Ti,Nb)2(Si4O12)(OH,O)2 · 3H2O Mon. Vuoriyarvite-K K2(Nb,Ti)2(Si4O12)(O,OH)2 · 4H2O Mon. Pyatenkoite-(Y) 3 photos of Tsepinite-Ca associated with Pyatenkoite-(Y) on mindat.org. Kentbrooksite 3 photos of Tsepinite-Ca associated with Kentbrooksite on mindat.org. Pekov, I. V., Chukanov, N. V., Ferraris, G., Gula, A., Pushcharovsky, D. Y., & Zadov, A. E. (2003). Tsepinite–Ca,(Ca, K, Na,□) 2 (Ti, Nb) 2 (Si4O12)(OH, O) 2· 4H2O, a new mineral of the labuntsovite group from the Khibiny alkaline massif, Kola Peninsula–Novel disordered sites in the vuoriyarvite-type structure. Neues Jahrbuch für Mineralogie-Monatshefte, 2003(10), 461-480.